CAUSE OF DAY AND NIGHT, WINTER AND SUMMER; AND THE LONG ALTERNATIONS OF LIGHT AND DARKNESS AT THE NORTHERN CENTRE. all over the rest of the earth in twenty-four hours, the centre, N, is left in continual darkness. But when, in six months afterwards, the sun is on the inner circle, A, the light extends beyond the arctic circle, 1, 2, 3; and as it moves in its course, the centre, N, is continually illuminated. These changes will be better understood by reference to the diagrams, figs. 61 and 62.
in darkness for several months in succession, or until the sun, by gradually coming nearer to the inner circle, throws his light more and more over the centre. The arc of light at 4, is the advancing or morning twilight, and 6, the receding or evening twilight. At every place underneath a line drawn across the circle of the sun's light, 4, 5, 6, through S, to N, it is noonday; and beyond the northern centre, on the same line, it is midnight. days and nights, morning and evening twilight, winter and summer, the long periods of alternate light and darkness at the northern or polar centre of the earth, arise from the expansion and contraction of the sun's path, and are all a part of one and the same general phenomenon. The whole of these explanations have reference only to the region between the sun and the northern centre. It is evident that in the great encircling oceans of the south, and the numerous islands and parts of continents, which exist beyond that part of the earth where the sun is vertical, cannot have their days and nights, seasons, &c., precisely like those in the northern region. 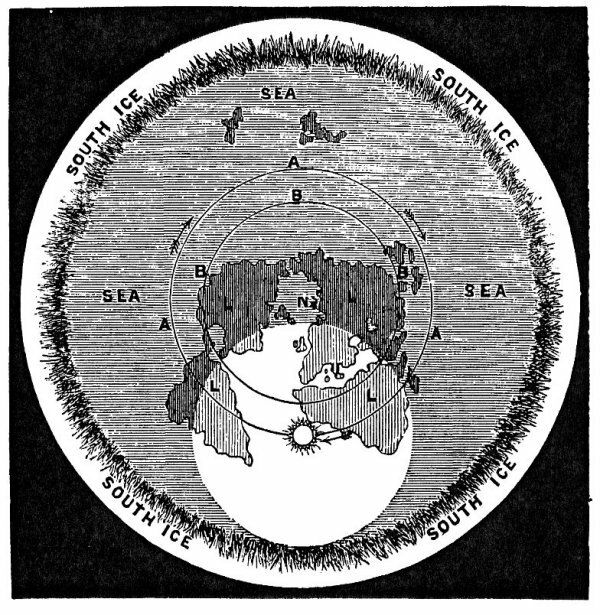 The north is a centre, and the south is that centre radiated or thrown out to a vast oceanic circumference, terminating in circular walls of ice, which form an impenetrable frozen barrier. Hence the phenomena referred to as existing in the north must be considerably modified in the south, For instance, the north being central, the light of the sun advancing and receding, gives long periods of alternate light and darkness at the actual centre; but in the far south, the sun, even when moving in his outer path, can only throw its light to a certain distance, beyond which there must be perpetual darkness. No evidence exists of there being long periods of light and darkness regularly alternating, as in the north. In the north, in summer-time, when the sun is moving in its inner path, the light shines continually for months together over the central region, and rapidly develops numerous forms of animal and vegetable life. Wrangell tells us that "Countless herds of reindeer, elks, black bears, foxes, sables, and grey squirrels, fill the upland forests; stone foxes and wolves roam over the low grounds; enormous flights of swans, geese, and ducks, arrive in spring, and seek deserts where they may moult, and build their nests in safety. Eagles, owls, and gulls, pursue their prey along the sea-coast; ptarmigan run in troops among the bushes; little snipes are busy among the brooks and in the morasses; the social crows seek the neighbourhood of men's habitations; and when the sun shines in spring, one may even sometimes hear the cheerful note of the finch, and in autumn, that of the thrush." twenty-four hours the great circle of the southern circumference, it has not time to excite and stimulate the surface; and, therefore, even in comparatively low southern latitudes, everything wears an aspect of desolation. These differences in the north and south could not exist if the earth were a globe, turning upon axes underneath a non-moving sun. The two hemispheres would at the same latitudes have the same degree of light and heat, and the same general phenomena, both in kind and degree. 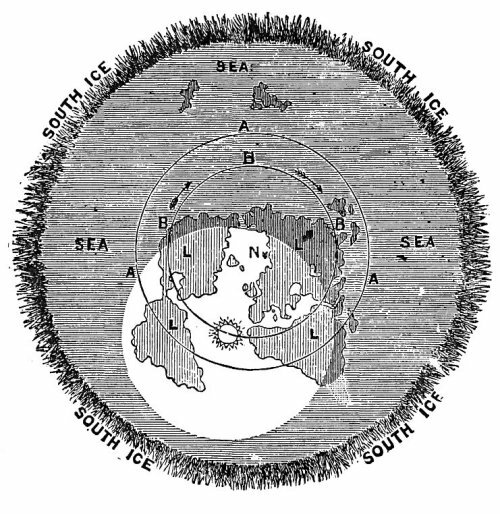 The peculiarities which are found in the south as compared with the north, are only such as could exist upon a stationary plane, having a northern centre, concentric with which is the path of the moving sun. The subject may be placed in the following syllogistic form. The peculiarities observed in the south as compared with the north, could not exist upon a globe. They do exist, therefore the earth is not a globe. They are such as could and must exist upon a plane. They do exist, therefore the earth is a plane. "Even in summer, people here have no notion of going without fires in the evening; but then, though the days are very warm and sunny, the nights are always cold. For seven months last summer, we had not one day that the sun did not shine as brilliantly as it does in England in the finest day in June; and though it has more power here, the heat is not nearly so oppressive. . . But then there is not the twilight which you get in England. Here it is light till about eight o'clock, then, in a few minutes, it becomes too dark to see anything, and the change comes over in almost no time." In a pamphlet by W. Swainson, Esq., Attorney General for New Zealand, (Smith, Elder, & Co., Cornhill, London, 1856,) among other peculiarities referred to, it is said that at Auckland, "of twilight there is little or none." degrees, and no sooner does the sun peep above the horizon, than all the gorgeous parade by which he is preceded is shaken off, and he comes in upon us in the most abrupt and unceremonious way imaginable." "The range of temperature is limited, there being no excess of either heat or cold; compared with the climate of England, the summer of New Zealand is but very little warmer though considerably longer. . . . The seasons are the reverse of those in England. Spring commences in September, summer in December, autum in April, and winter in June. . . . The days are an hour shorter at each end of the day in summer, and an hour longer in the winter than in England." "The summer mornings, even in the warmest parts of the colony, are sufficiently fresh to exhilarate without chilling; and the seasons glide imperceptibly into each other. The days are an hour shorter at each end of the day in summer, and an hour longer in winter than in England." "At Wellington, New Zealand, December 21st, sun rises 4 h. 31 m., and sets at 7 h. 29 m., the day being 14 hours 58 minutes. June 21st, sun rises at 7 h. 29 m., and sets at 4 h.
[paragraph continues] 31 m., the day being 9 hours and 2 minutes. In England the longest day is 16 hours 34 minutes, and the shortest day is 7 hours 45 minutes. Thus the longest day in New Zealand is 1 hour and 36 minutes shorter than the longest day in England; and the shortest day in New Zealand is 1 hour and 17 minutes longer than the shortest day in England." rotundity; but "the earth a plane," and they are simple "matters of course." Upon a fixed plane underneath a moving sun, these phenomena are what must naturally and inevitably exist; but upon a globe they are utter impossibilities. a little the worse for grog. However, I went aloft, and before I had finished the order, which was a very short time, I was in pitch darkness,--the sun seemed all at once to drop behind or below the sea. I noticed this all the time we were in the far south, whenever the sun was visible and the evening fine; and I only mention it now as corroborating the lecturer's statement. Any mariner, who has been a single season in the southern whaling grounds, will tell you the same thing." First, if no atmosphere existed, no doubt the light of the sun would diffuse over the whole earth at once, and alternations of light and darkness could not exist. Secondly, as the earth is covered with an atmosphere of many miles in depth, the density of which gradually increases downwards to the surface, all the rays of light except those which are vertical, as they enter the upper stratum of air are arrested in their course of diffusion, and by refraction bent downwards towards the earth; as this takes place in all directions round the sun--equally where density and other conditions are equal, and vice versâ--the effect is a comparatively distinct disc of sun-light. 116:1 "Arctic Explorations." By W. & R. Chambers. Edinburgh. 118:1 "Polar Explorations." Read before the Royal Dublin Society. Next: Chapter IX. Cause Of Sunrise And Sunset.